We call that the scenic route. I went to Hawaii earlier in the year and this one waterfall had a fish that used a sucker on its belly to climb ~400ft (~130m) to the top during breeding migration… what I’m trying to say is that waterfall climbing is very easy and fun for the whole family. 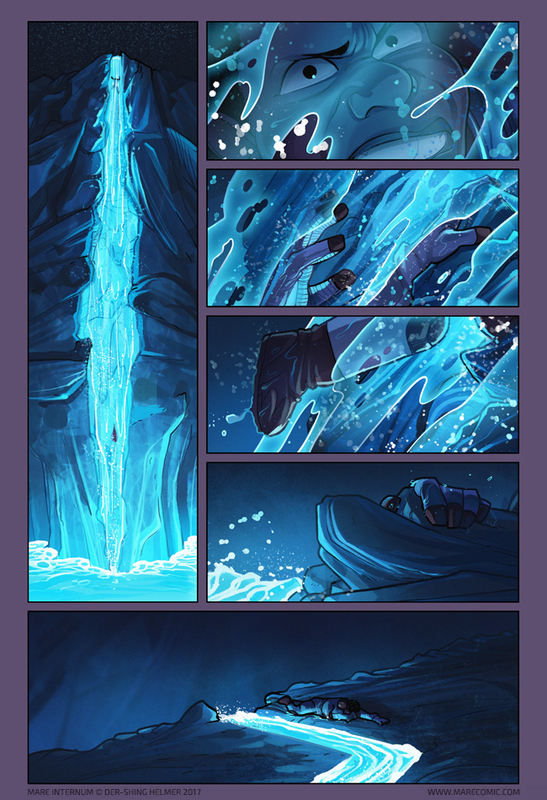 Hey, this is page 201, making MI officially… a 200+ page comic B] kinda cool. Not much to add, just stuff from last time if you missed it, two MI Patreon posts for an edited creature and bg tech. Alloy pitch submissions are open for one more week! Next plot twist: Bex finds out that she have grown a sucker friend on her belly! Plot Twist: we find that Bex just climbed up The Processor’s urinal. The Processor decides Bex must be sentient poo and decides to puke on Bex and then run away. Looks like her water breaks ! haha get it? i know some of you get it. i’m still struggling, is thys all real? Feels so much connected to their previous live and trauma on Earth. I think that’s her backpack, heading for parts unknown. If I understand the panels correctly, the rushing water tore off Bex’s improvised backpack? Wish I had a sucker on my belly. Commuting would be a lot more interesting. Visit a candy store and you can have as many suckers as you want. Except they go in your belly. Life is just a long series of compromises, isn’t it? That is a sharp left turn there. It looks intentional. Related real-world news! Japanese scientists announce their orbiter found a giant lava tube on Earth’s Moon! I’ll take “things that wouldn’t work on Earth” for $400, Alex. Ha! I think Shing gave something away. I thought of those fish and I’m excited that that was actually a valid connection! Which parts? Just the fleshy parts or the bony parts too? This sequence contrasts with Mike’s big climbing sequence sooooo well. Thank the processor for Martian gravity. It is important to be properly hydrated when meeting the processor. Bex’s face in panel 2 is one of ‘this place is *really* starting to piss me off!’.